The P-38 Lightning was one of the most feared fighters of World War II. Retail $19.94 SAVE 23% ! I just got back into this hobby and I have been buying Revell Monogram models for practice and this model is a good example of why. Need practice puttying, sanding, difficult canopies, cleaning up flash? This guy won&apos;t let you down. Like I said I have been using this brand for practice and it&apos;s time to move on after this. This will be the last Revell/Monogram model I will purchase but I&apos;m glad they offer inexpensive models that a person can use to practice skills on before moving on to better quality products. Detailed cockpit with instrument panel and fold-back canopy. Detailed decals for 3 versions. "Good potential, but has issues"
This kit has a lot of potential. First of all, the kit allows you to build three different versions of the P-38; a Pathfinder version, a night fighter version, and a more standard fighter version. Unfortunately, that does cause problems with the directions, because they are not always clear which version it applies to. Not only that, but the sequence on the directions did not really make much sense. It is tail heavy, but there is an extended piece of plastic from the tail to help counter that (the directions instruct you to remove it, but then your plane will be sitting on its tail). There also was a lot of trimming required to get rid of excess plastic from the parts. Throughout most of the build, I did not have many problems with the fit of the pieces. However, that quickly ended when I got to the nose section. It was almost funny how bad the fit was (looked almost like a beak at first), and no amount of trimming was going to help it. The hood over the gun block also fit poorly, although it can be fixed to a certain degree. However, the fact that the hood opened up into the detailed gun block was a nice touch. In the end, with some extra work, you can make a pretty good looking model! "The worst of the 1/48 P-38 kits." This kit from Revell of China has been around in one form or another since the 1960&apos;s. It is a old kit that can&apos;t compete with more modern releases. Hands down the worst 1/48 scale P-38 kit you can buy. Even considering the price its not a good value. The downsides are as follows: - Poor fitting parts that need a lot of filler and sanding - Raised panel lines - Ejector pin marks - Excessive casting flash - Revell China Etc. molded in raised letters on the outside of the A/C that need be sanded off - Zero wheel well detail. Just a empty void - Nose is a mess requiring lots of trial and error not to mention putty to make it look respectable - Optional versions require a lot of surgery/cutting if your going to build one - Canopy frames lack definition making it near impossible to mask and spray. - Attachement points for landing gear doors non existent. - Instructions are vague and lack clarity. If your new to modeling and don&apos;t wish to spend a lot of money I still wouldn&apos;t recommend it. If you want to hone your skills with seam filling and sanding of poor fitting parts then maybe, otherwise better choices abound. while a challenge to build, this kit blew me away! it always amazes me how the model engineers capture the essence of all the aircraft they design a model kit for. 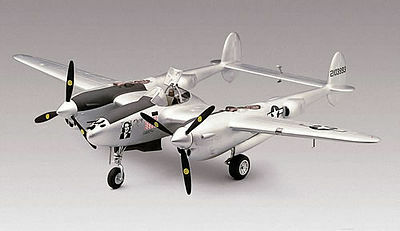 in this scale, the p-38 requires some skill to craft the kit into a showpiece that will draw your attention. once again revell supplies enough wow factor with opening panels and exquisite details that make you want to examine the finished model just a little more. i had a blast crafting this kit, and would recomend it to anyone. alittle patience goes a long way, but it&apos;s definitely worth the time and attention. bang for the buck is off the charts! i will consider buying the kit again to build one of the other versions that the kit supplies extra parts for. i had a tough time deciding which version to build, so i&apos;ll most likely take a second or even third crack at this one. awsome kit. #1: P-38J, 2103993, "Marge", Maj Richard I Bong, USAAF, Pacific Theatre. #2: P-38J Droop Snoot, 7F Q, "Bomba-Dear, USAAF. #3: P-38M Night Lightning, 426865, USAAF, Pacific Theatre.